As a young boy, Oliver York witnessed the murder of his wealthy parents in their London apartment. The killers kidnapped him and held him in an isolated Scottish ruin, but he escaped, thwarting their plans for ransom. Now, after thirty years on the run, one of the two men Oliver identified as his tormentors may have surfaced. Emma Sharpe and Colin Donovan are enjoying the final day of their Irish honeymoon when a break-in at the home of Emma’s grandfather, private art detective Wendell Sharpe, points to Oliver. The Sharpes have a complicated relationship with the likable, reclusive Englishman, an expert in Celtic mythology and international art thief who taunted Wendell for years. Emma and Colin postpone meetings in London with their elite FBI team and head straight to Oliver. But when they arrive at York’s country home, a man is dead and Oliver has vanished. As the danger mounts, new questions arise about Oliver’s account of his boyhood trauma. Do Emma and Colin dare trust him? With the trail leading beyond Oliver’s small village to Ireland, Scotland and their own turf in the US, the stakes are high, and Emma and Colin must unravel the decades-old tangle of secrets and lies before a killer strikes again. New York Times bestselling author Carla Neggers delivers the gripping, suspense-filled tale readers have been waiting for. Welcome to my stop on the blog tour for Thief’s Mark! If you want to follow along with the tour check out TLC Book Tours for the full schedule. Thief’s Mark is the seventh book in a series featuring FBI agents Emma Sharpe and Colin Donovan but I haven’t read any of the previous books, I just decided to start here after hearing such good things about this series. There did seem to be very extensive back stories relating to not only the two main characters, but also the secondary ones and I have to admit I felt like I was missing out a little. Neggers did provide some background information as to past events, but I feel like if I had actually read the earlier books I would’ve been better prepared and informed about what exactly was going on, I was missing some subtle nuances. I don’t want to dissuade anyone from reading this as a standalone, just for me personally I feel I would’ve benefited and enjoyed this one more had I been caught up. Sharpe and Donovan are wrapping up their honeymoon when they get roped into assisting an investigation surrounding an old cold case involving their sometimes friend Oliver. This was a multifaceted mystery, a good old fashioned whodunnit that was on the lighter side, there’s no gore or overly descriptive violence here. There are many various plot threads running through this book and when things came to a head it was unexpected and unpredictable. This has romantic elements and is very much a romantic suspense so if you like a dash of love in a murder mystery, you’ll like this one. I really liked both Sharpe and Donovan, I was sort of reminded of Catherine Coulter’s FBI series with Sherlock and Savich, just not as heavy, so if you like that series give this one a shot! Thanks to the publisher and TLC Book Tours for my review copy. 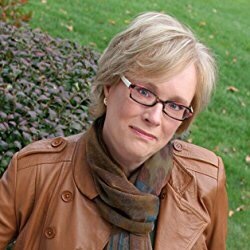 Carla Neggers is the New York Times bestselling author of more than 60 novels, including her popular Sharpe and Donovan and Swift River Valley series. Her books have been translated into 24 languages and sold in over 35 countries. A frequent traveler to Ireland, Carla lives with her family in New England. To learn more and to sign up for her newsletter, visit CarlaNeggers.com. 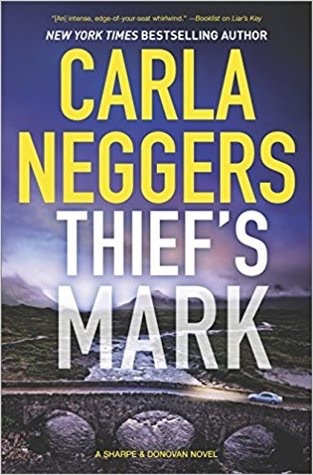 Check out the book, Theif’s Mark, by Carla Neggers, as featured on the Novel Gossip blog.